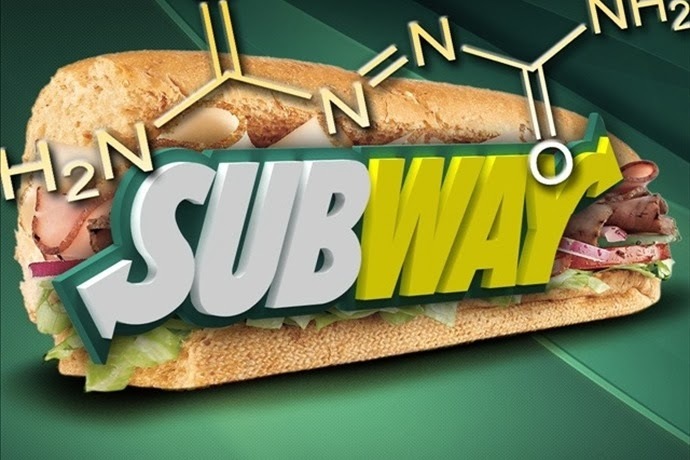 A chemical called azodicarbonamide is being removed from bread sold at Subway restaurants. Although consumers were unaware that such a chemical even existed, the restaurant announced that it would no longer be used as an ingredient in its bread. Azodicarbonamide is the principal chemical used in the production of foam plastics, plastics and synthetic leather. Examples of products using the chemical include yoga mats and shoe soles. Although it has been banned in Europe since August 2005 for the manufacture of plastic products that come into direct contact with food, the American Food and Drug Administration (FDA) considers it safe. Why was it used in Subway bread? The technical explanation of how azodicarbonamide works is that the thermal decomposition of azodicarbonamide results in the evolution of nitrogen, carbon monoxide, carbon dioxide, and ammonia gases, which are trapped in the polymer as bubbles to form a foamed article. In other words, it produces the air between the foam. It does the same thing to bread, making it soft and fluffy. The World Health Organization has linked azodicarbonamide to "respiratory issues, allergies and asthma" among people who work at places where the chemical is made. Although the FDA says the amount used as a food additive is safe, would you want to knowingly consume this chemical? Subway agreed to remove the chemical when an activist blogger named Vani Hari researched ingredients in Subway's bread and found the existence of the chemical. The company took action to begin removing the chemical from its bread but also stated that was their intention even before Hari approached them regarding the concern. Subway claimed it was going to be removed anyway as part of a product improvement initiative.